SALT LAKE CITY (AP) — U.S. Rep. Ben McAdams is rescheduling town hall meetings because Congress is expected cancel its typical Martin Luther King Day holiday break as the government shutdown drags on. 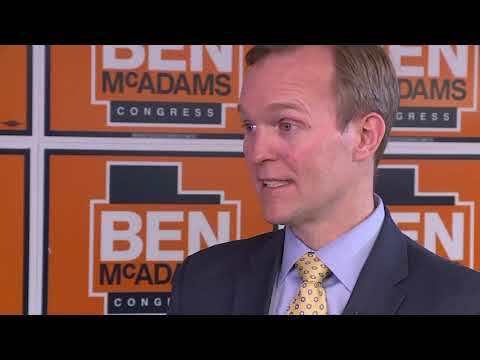 The Deseret News reports McAdams said in a statement Wednesday that he hopes the new times are not too inconvenient for his constituents. SALT LAKE CITY (AP) — Newly installed Congressman Ben McAdams will hold town hall meetings in January after a race where he said his opponent hadn't held enough. He said in a statement Tuesday that he wants to begin helping his constituents with issues they might be having with the federal government. McAdams will hold an open house in West Jordan the afternoon of Jan. 22, a town hall meeting in Lehi the evening on Jan. 23 and a another town hall in West Valley City on Jan. 24. SALT LAKE CITY (AP) — The first black Republican woman in Congress is joining CNN as a commentator after being unseated by a Democratic challenger in November. Former U.S. Rep. Mia Love of Utah tweeted Monday that she'll offer a "different, principled and unleashed perspective" on the cable news network. SALT LAKE CITY (AP) — Outgoing U.S. Rep. Mia Love of Utah missed almost 84 percent of votes in the U.S. House since she lost her re-election in November. The website GovTrack, which records lawmakers' voting habits, shows the Republican congresswoman participated in only 14 of 85 votes since losing her race to Democrat Ben McAdams. Love's spokesman Richard Piatt told the Salt Lake Tribune that Love has been home with a sick child recently. SALT LAKE CITY (AP) — The fierce battle for a U.S. House in Utah where Democrat Ben McAdams narrowly unseated Republican Mia Love was one of the most expensive races in Utah history, new figures show. About $11.4 million was spent by the two candidates and outside political groups, according to new information from the Federal Election Commission. SALT LAKE CITY (AP) — The first and only black Republican woman in Congress delivered a sharp rebuke Monday to President Donald Trump and her party's relationship with African-Americans in her first remarks since her midterm defeat. SALT LAKE CITY (AP) — A Utah lawmaker wants to put an end to straight-party ticket voting, the process when voters mark just one box on a ballot to cast votes for all candidates running under one party's banner. Rep. Patrice Arent, D-Millcreek, announced she plans to draft legislation to end the voting method, The Salt Lake Tribune reported Thursday. SALT LAKE CITY (AP) — Utah's Mia Love was tabbed as a rising star in the GOP when she became the first black Republican woman in Congress with her 2014 victory. But she became the latest Republican incumbent to fall in the midterm election's Democratic wave that has seen more than three dozen Republican-held seats flipped across the country. Republican Rep. Mia Love says she will be calling Democrat Ben McAdams after final election results show he defeated her to flip the U.S. House race in deep-red Utah. Love said in a statement Tuesday night that she is traveling with her family for the Thanksgiving and will hold a news conference Monday in Salt Lake City to speak about the race. SALT LAKE CITY (AP) — Democrat Ben McAdams declared victory Monday night in the tight race for a U.S. House seat in Utah, but his opponent Republican Rep. Mia Love didn't concede and The Associated Press has not called the race. Democrat Ben McAdams is declaring victory after a vote dump shows he's retaken the lead over incumbent Republican U.S. Rep. Mia Love in a tight race that's close to the recount zone. SALT LAKE CITY (AP) — Utah Republican Rep. Mia Love lost a court challenge Friday to halt vote-counting in one key county, but took the lead with new vote tallies in a race so tight it's within the recount threshold. Love, the first black Republican woman elected to Congress, flipped the lead that Democrat Ben McAdams had held since election night to move ahead by 419 votes in a race where about 257,600 ballots have been counted so far, according to new results. Utah Republican Rep. Mia Love has taken the lead over her Democratic challenger in a race so tight it's within the recount threshold. SALT LAKE CITY (AP) — Utah judge rejects Republican U.S. Rep. Mia Love's lawsuit asking for an end to vote counting in tight House race. Utah Democrat Ben McAdams' lead over incumbent Republican Rep. Mia Love remained razor thin in race that remains too close to call. SALT LAKE CITY (AP) — A Utah judge was weighing a lawsuit Thursday that could halt some vote-counting in the race where Republican U.S. Rep. Mia Love is trailing her Democratic challenger by a razor-thin margin. He did not immediately rule. Judge James Gardner questioned why Love's attorneys had waited more than a week after Election Day to file the lawsuit against Democratic-leaning Salt Lake County over signatures on mail-in ballots. "You're at the 11th hour," Gardner said. SALT LAKE CITY (AP) — Republican U.S. Rep. Mia Love sued Wednesday to halt vote counting in the Utah race where she is trailing her Democratic challenger by a razor-thin margin, saying her campaign must be allowed to issue challenges if they dispute the validity of mail-in ballots. SALT LAKE CITY (AP) — Utah Republican Rep. Mia Love continued to cut into her Democratic challenger's lead Wednesday, more than a week after Election Day. Earlier in the day her campaign sued to halt the vote count. Love made up ground on Wednesday, slicing Democrat Ben McAdams' lead to less than 900 votes. SALT LAKE CITY (AP) — Republican U.S. Rep. Mia Love has cut into Democratic challenger Ben McAdams' lead as vote-counting continues in the race that remains too close to call a week after Election Day. Results released Tuesday slice McAdams' lead from just under 3 percentage points to a razor-thin margin of less than 1 percent. The Democratic Salt Lake County mayor remains ahead by about 1,400 votes, in a race where a total of about 230,000 ballots have been counted so far. The hard-fought race between Republican U.S. Rep. Mia Love and Democratic challenger Ben McAdams is still in play, three days after the polls closed. New results released Friday cut into McAdams' approximately 3 percent lead, but the race remains too close to call with many ballots from Republican-leaning Utah County still uncounted. SALT LAKE CITY (AP) — Utah Gov. Gary Herbert has harsh words for election officials in a county with long voting lines and uncounted ballots in a still-undecided Congressional race. Herbert said in a statement Thursday that Utah County is the "the epicenter of dysfunction" anytime glitches are reported on Election Day. Republican U.S. Rep. Mia Love remains locked in a tight race with Democratic challenger Ben McAdams as she fights to keep her House seat in a largely suburban, politically mixed district. SALT LAKE CITY (AP) — President Donald Trump on Wednesday said Utah Rep. Mia Love is trailing in her re-election bid because she's kept him at arm's length. The Associated Press has not yet called the race, but Trump claimed his fellow Republican "lost" after a campaign where she stressed her willingness to speak out on issues like immigration. SALT LAKE CITY (AP) — Democrat Ben McAdams was leading Republican Mia Love in his bid to flip a U.S. House district in deep-red Utah Tuesday night, but the marquee race was too close to call. Both candidates said they were hopeful as they made brief appearances at election night parties. SALT LAKE CITY (AP) — Utah voters on Tuesday will elect a new U.S. senator to replace Orrin Hatch, choose whether U.S. Rep. Mia Love earns a third term and decide if the state should make medical marijuana legal. WEST JORDAN, Utah (AP) — Days before voters decide a razor-thin contest for one of Utah's U.S. House seats, Republican Rep. Mia Love and challenger Ben McAdams hit the streets to bring out every last voter in the race Democrats are targeting as they push for control of the chamber. Love and her team climbed aboard a modified blue-and-orange motor scooter as they chatted with people mowing their lawns and heading to grocery stores. SALT LAKE CITY (AP) — If a Utah race is too close to call on Election Night — a possibility in the slugfest between Republican Rep. Mia Love and Democrat Ben McAdams — residents and candidates will have to wait to find out who won because the state recommends counties wait three days before posting more results. SALT LAKE CITY (AP) — Republican U.S. Rep. Mia Love has released a Federal Election Commission email saying she can legally keep most of the $1 million she raised for a primary where she was unopposed. Love said the email clears her in a fundraising flap that's taken center stage in the tight race, but Democratic challenger Ben McAdams' campaign said little has changed. SALT LAKE CITY (AP) — Republican U.S. Rep. Mia Love says the Federal Election Commission is siding with her on questions of whether she improperly raised money for a primary that never happened, but the agency isn't commenting and Democrats aren't backing down. SALT LAKE CITY (AP) — Democrat Ben McAdams has more money going into the final weeks of his campaign challenging Republican U.S. Rep. Mia Love in Utah's most competitive race, according to new fundraising reports. Love outraised McAdams, but also spent more as the race heated up in the district where voters have been wary of President Donald Trump. SALT LAKE CITY (AP) — U.S. Rep. Mia Love clashed with her Democratic challenger Monday as she defends her seat in a close race where suburban voters have been wary of President Donald Trump and national Democrats are hoping for a win in a push to regain control of the House of Representatives. Challenger Ben McAdams said Love "votes on autopilot" with Republicans and Trump, while Love shot back that she stands up to the president more than other Utah Republicans on issues such as immigration. U.S. Rep. Mia Love has clashed with her Democratic challenger as she defends her seat in a tight race targeted by national Democrats in a push to regain control of the U.S. House. 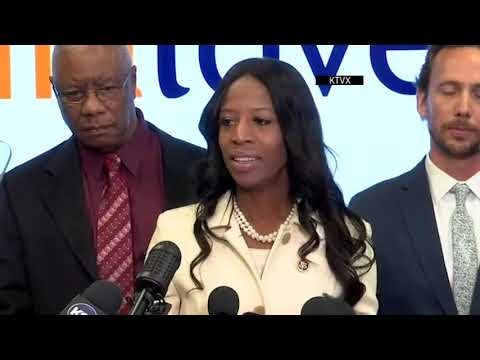 SALT LAKE CITY (AP) — Republican U.S. Rep. Mia Love's campaign said Monday it will refund or re-designate up to $380,000 in contributions after the Federal Election Commission issued a warning about more than $1 million collected by her campaign for a primary that never happened. PROVO, Utah (AP) — Authorities have banned target shooting on more than 2,000 acres of public land near Utah Lake to protect ancient petroglyphs, prevent wildfires and keep nearby homes safe. The area remains open for in-season hunting. PROVO, Utah (AP) — Authorities have banned target shooting on over 2,000 acres of public land near Utah Lake to protect ancient petroglyphs, prevent wildfires and keep nearby homes safe. The Daily Herald reports the interim ban went into effect Thursday on Lake Mountain area land managed by federal and state authorities. SALT LAKE CITY (AP) — Facing a tight re-election race in a district Democrats hope to flip, U.S. Rep. Mia Love tapped Mitt Romney and other boldface Republican names at a rally Friday. "We've got to make sure the Democrats don't get their hands on this seat," Sen. Mike Lee said. "We need Mia Love to get re-elected. We need her very, very badly." SALT LAKE CITY (AP) — U.S. Rep. Mia Love will hold open office hours to hear from people in her district for up to 10 minutes at a time on Wednesday. Her office says in a statement she will meet with small groups at her West Jordan office to hear about the issues they care about. She will take meetings on a first-come, first-serve basis. To participate, people must live in her district, which covers politically mixed Salt Lake City suburbs and north-central regions of Utah. SALT LAKE CITY (AP) — Republican U.S. Rep. Mia Love's latest fundraising reports show her outraising her Democratic challenger in what's considered the state's most competitive race, though the Ben McAdams campaign says their lower overall spending means the race is nearly tied for cash on hand. The McAdams campaign said in a statement Friday they have about $1.25 million in the bank, slightly more than Love's $1.23 million balance at the end of June. SALT LAKE CITY (AP) — Salt Lake County Mayor Ben McAdams is vetoing plans for an 8,800-home suburban development following an outcry by neighboring residents. McAdams vetoed plans for the Olympia Hills project Friday after residents blasted the proposal during a town hall the previous evening. Residents said the proposal was sprung on them. They said the development's relative high density would lead to heavy traffic and strain local resources. SALT LAKE CITY (AP) — A proposed 8,800-home development was thrust into the campaign for Utah's sole battleground House district Monday, as local residents plotted a referendum to kill the project. Republican Rep. Mia Love called on her opponent, Salt Lake County Mayor Ben McAdams, to block the proposal by vetoing the necessary zoning reforms. McAdams, a Democrat, worked to delay the plan last week, but Love dismissed that as him "trying to look like a power broker" amid rising public opposition. SALT LAKE CITY (AP) — Salt Lake County's municipal board has agreed to delay approval of a large development project following concerns raised by county Mayor Ben McAdams. McAdams's spokeswoman Alyson Heyrend said Friday that the board agreed to postpone its June 13 meeting after speaking with the mayor. SALT LAKE CITY (AP) — The Democrat running in Utah's closest-watched congressional race says he won't support Minority Leader Nancy Pelosi for speaker of the House. Salt Lake County Mayor Ben McAdams said Thursday he would not vote for Pelosi to lead the party if Democrats regain control of the U.S. House.